Getting geared up for a weekend in the mountains? Well, no one wants to sit in the backseat with snowboards and skis across their laps. So, avoid that completely, and get yourself some Rhino Rack ski & snowboard carriers. Rhino Rack is here to make sure that boards and skis on are the roof, and buddies are in the car. Rhino Rack offers a wide variety of carrying capacities to fit your needs. You have the option for a two ski carrier, four pair ski or two snow board carrier, and a six pair ski or four snowboard. Ski and snow board carriers offer a lock and key, and are easily operated for quick access to your equipment. The Rhino Rack ski and snowboard carriers have a universal mounting system will fit virtually any crossbars on the market. Winter over, no powder left to thrash? These guys work pretty darn well for transporting fishing poles too. The rubber grip offers excellent protection for fishing poles, as well as ski and snowboard finishes. This winter, be prepared for the slopes with the best snowboard and ski carrier in the business. 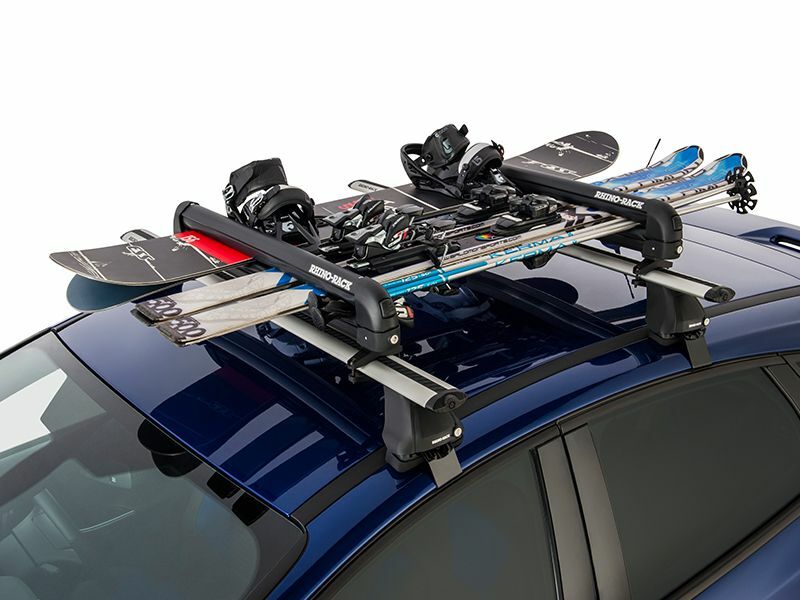 Rhino Rack ski & snowboard carriers are exactly what you need to make this the best winter yet. Get yours today! Rhino Rack backs their ski & snowboard carriers, and the multi-purpose rack with a five year warranty. Please give us a call at 1-877-216-5446 with any questions. Rhino Rack ski & snowboard carriers offer a universal mounting system that will fit virtually all racks on the market. The multi-purpose rack offers a great selection of mounting systems to work with all major racks. Installation instructions are included with purchase, and are also available on our site. Of course, if you have any questions, please give us a call at 1-877-216-5446 or 701-253-5906.